Based on comments from the last post by Satyr Magos, I got the idea to make a sigil wheel, much like the Rose Cross Sigil Wheel. 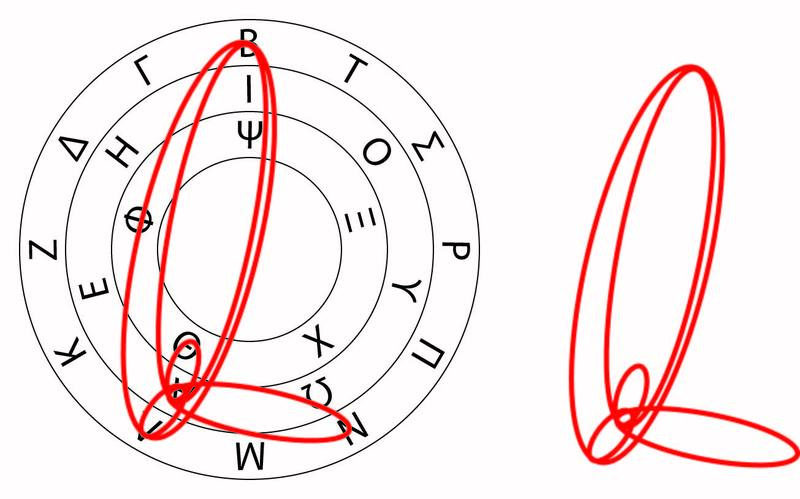 The idea is simple: have several rings of letters (Hebrew, in the case of the Rose Cross Sigil Wheel), and draw lines between successive letters to make a sigil. There are different rules behind this, such as making loops or crests for doubled letters and starting off with a dot and ending with a line, but the idea is fairly straightforward. 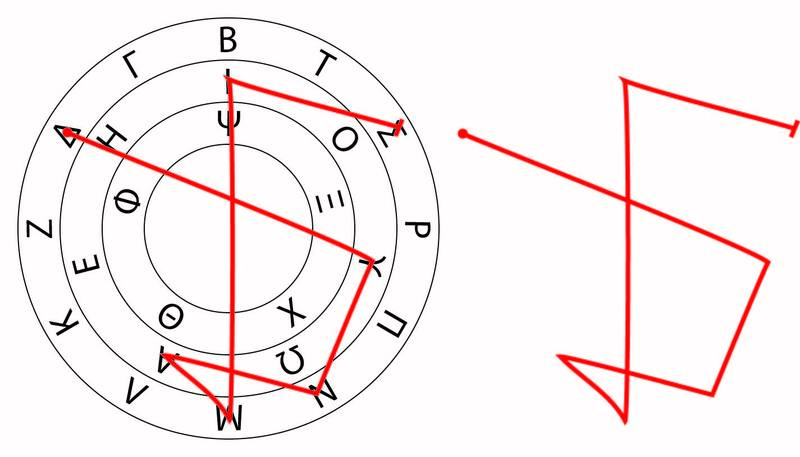 Based on the division of Greek letters into elements, planets, and signs by means of stoicheia, Satyr Magos was looking for “a Greek-alphabet sigil map (akin to the Rose Cross in theory, but based on its own internal logic)”. I decided to go ahead and try my hand at one possible arrangement of a sigil wheel, which resulted in the following. The innermost wheel containing the letters psi, ksi, khi, theta, and phi correspond to the five elements of Aether, Water, Fire, Earth, and Air; the order comes from the standard elemental attribution of the elements to the pentagram. 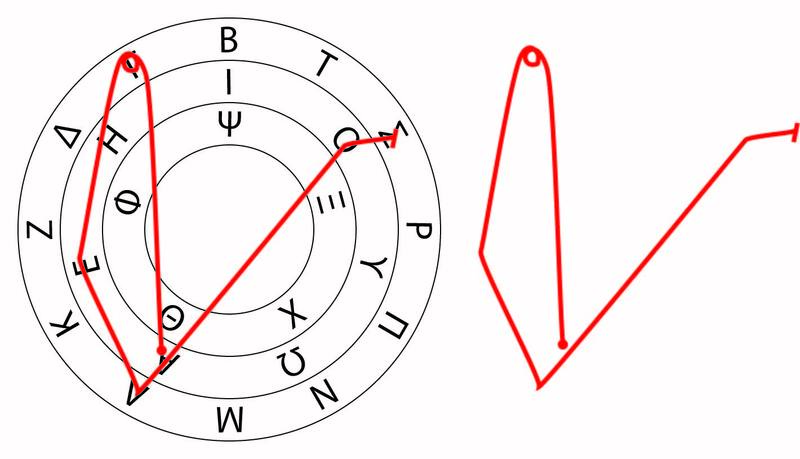 The middle wheel containing the letters iota, omicron, upsilon, omega, alpha, epsilon, and eta correspond to the seven planets. They’re in the same order as the normal planetary heptagram, but with the Sun aligned towards the top (here represented by iota), and the heptagram formed between them drawn counterclockwise yielding the order of the weekdays. The outermost ring containing the rest of the consonants of Greek correspond to the twelve signs of the zodiac, starting with Aries (beta) at the top and going counterclockwise, as is seen on horoscopes. Seen from a cosmological viewpoint, the outermost wheel represents an idea coming from outside and through the sphere of the fixed stars, or Kether and Chokmah; the middle wheel represents the seven planetary spheres, or Binah through Yesod, and the innermost wheel represents the Earth and Malkuth with its four elements plus Aether. Aries, the Sun, and Aether are all aligned since the Sun has its exaltation in Aries, and Aries is the beginning and entrance of new spirit into the universe, and the Sun is the representation of the Spirit and Logos in manifestation. I claim it makes sense as one way to order such a sigil wheel. That’s enough explanation of the construction. Onto the rules for using the Greek sigil wheel! The rules are to start drawing a (potentially) crisscrossed line, with each corner of the line touching a different letter. The resulting angular figure is the sigil of that particular word or name. The initial point of the sigil is marked with a dot, and the final point is marked with a line. If a certain letter is repeated, you make a little notch or niche at that particular letter; if a straight line crosses through a letter on the way to another one, the line has a little loop or bump on that letter. Confused? Don’t be. Let’s try an example with my name first written in Greek (ΠΟΛΥΦΑΝΗΣ). 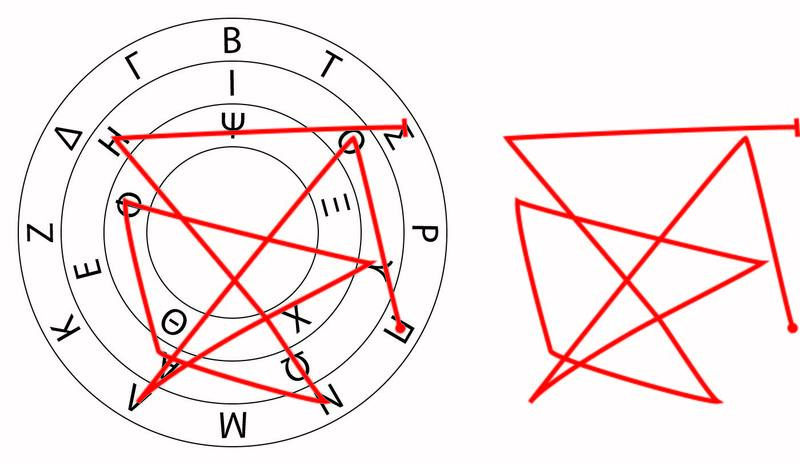 On the left we have the Sigil Wheel with the path of the sigil drawn out, starting at pi on the outermost ring with a large red dot, going to omicron, then lambda, and so on. On the right, we have the sigil itself for my name. Let’s try another. Say you want to channel the forces of Mars into something using this format of sigil. In Qabbalistic terms, you’d want the forces of Geburah, which in Greek is translated ΔΥΝΑΜΙΣ, or “Power”. You’d create the following sigil and emblazon it on whatever you’d want to be made all Martian-y. Notice how we’re crossing over psi completely, since it’s not included in the word at all. If it were (viz. ΔΥΝΑΜΨΙΣ) then we’d make a loop over that letter to mark that we’re not just ignoring it. Say you want a sigil of the word for angel in Greek, which is written as ΑΓΓΕΛΟΣ (Greek uses a double gamma to represent the “ng” sound, because the Hellenes hate you and your orthographic good sense). In that case, we make a loop or a notch at gamma when we do this sigil. Otherwise, it’s pretty straightforward. As an alternative to the Rose Cross Sigil Wheel, this Greek Sigil Wheel might actually stand a chance. It’s entirely new, as far as I know, and could probably stand to go through a few refinements and tweaks. May as well give it a try, though, until then. For people who operate in a more Hellenic or pagan Hermetic method, as opposed to the Judeo-Christian field, this could be a very useful tool for their Work. « Fiery Walls of Protection, Elemental Analyses, and More! You’ve also just answered one of the geeky questions that was lurking at the back of my brain (does he spell his name with an eta or an epsilon?). I actually just learned the declension of πολὺ, πολλὴ, πολὺ … sadly, however, I cannot find φανες in either of the lexicons I have on hand. Also, a borderline pedantic correction: while we do get the English word “angel” from the Greek ἄγγελος (angelos), in Attic it simply meant “messenger”, as per the verb ἀγγέλω (angelo) “I deliver a message”. It may have served double-duty in the New Testament, but I’ll have to look that up. Polyphanes is constructed like Aristophanes (Ἀριστοφάνης), spelled with an eta and not an epsilon. I have many appearances, all the same, all different to different people. The art was all of ten minutes’ fiddling with Adobe Illustrator, so have at. I’d be very interested in seeing some of the orders or versions you came up with, since this was just one of many possible orders or arrangements of letters that’re possible here. If you’re feeling generous, please share. As for angel/messenger, yes, I’m aware of the differences and etymology. To me, at least, they’re the same thing; from what I’ve read angels have no independent will of their own but are compartmentalized forms of the will of the Nous, and can be seen as arms or messengers of the One. Good catch all the same, though! love this. I should point out that the style of this reminds me of the ring of solomon from the goetia with the three concentric circles with the names of God in them, but instead calling upon the elements, planets and fixed stars. I’m an Esoteric Hellenist, and I’ve been looking for a way to create sigils in a way that’s more consistent with my tradition, and I have to say, this is it. I’ve tested this out several times, and it makes beautiful and powerful symbols. It works really well when you use full epithets of deities, which you can find listed on the http://www.theoi.com website. I’m glad it’s helped! The sigils of godnames and epithets really does turn out beautiful, too. I loved your concept. How would I translate an intent or word in English to Greek first though? I was thinking a non-English version appearing esoteric would nothing but aid the work, given how familiar I am with English. Could you please point me the way to learn it or is there a chart I could refer to? You’d find the appropriate word in Greek. I suggest using Lexilogos’ Ancient Greek Dictionary resource, which I use quite frequently. You might also consider looking up in other grimoires for similar terms, since many grimoires of the Middle Ages and Renaissance were fond of using Greek terms for some things or offering Greek glosses. AAAAAAAAAAAAAAAHH!!!! I AM BLIND! I should have put on sunglasses before looking at this. I did, several times, and I can’t make much out of it. It’s mostly music-based, and that’s not something I’m able to understand. It’s not of much value for me. For some reason, I figured you for being more musically literate than I. I have actually downloaded a composition app to be able to teach myself notation and reproduce some of his examples. Young Magi in training: learn to sing and play an instrument, and do a bit of acting if you can. I missed out on that. I’ve tried to learn music, but I’ve never been one to be able to get the hang of tones. If anything, I should go more on the rhythm route, which is as important as tone, I claim. The harmony of beat is another example of a harmony of tones.